When I was a child, not so very long ago, I loved to read stories about real children having adventures. Stand outs in my memory were such tales of derring do as The Swiss Family Robinson by Johann David Wyss, and Enid Blyton's Secret Seven or Famous Five books. 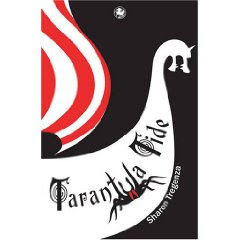 If you're looking for just such a rattling good adventure story, try Tarantula Tide, written by Sharon Tregenza, and published in the Kelpies series by Floris Books. When Jack and his mother arrive in Lerwick on the Shetland Islands for a holiday, they have no idea they will be plunged into an adventure involving smugglers, police, an angry biker and a gigantic spider named Octavia. Jack soon meets Izzie, the girl who lives next door to their holiday cottage, and together the two slowly and believably piece together the mystery surrounding Octavia. Tregenza knows how to create authentic characters. Jack is a typical twelve-year-old, plugged into his iPod and eating crisps for breakfast. He is harbouring a secret which makes him moody and grumpy. He's also clumsy, and when we meet him, he's just thrown up over a biker's new boots. Izzie, the girl next-door, loves animals, and introduces Jack to her world of growling puffins, shetland ponies, chameleons and Oriental Fire-Bellied Toads. There's a nice balance of drama, humour and excitement in Tarantula Tide. Sharon Tregenza won the Kelpies 2008 prize for this first novel, and has been nominated for the Branford Boase Award for first novelists. My inner editor picked up on several typos in the text, but I doubt the suggested audience of 8-12 year-olds will have a problem with that. I think they'll enjoy this fast-paced adventure.